WELCOME - Ravenworks Art Studio showcases the bronze sculptures by Roy Peratrovich, Jr. The Artist - Roy is a self-taught artist, combining his observations of nature with his Alaska Native heritage. He is a Tlingit Indian and a member of the Raven Clan. Often drawing on tribal legends, he loves telling a story through his art. The Art - Please browse the online gallery! The artist invites your comments on his work via the e-mail link. Purchase arrangements can be made directly with the artist. Tags: Bronze Sculpture, Bronze Wolf Sculpture, Bronze BearSculpture, Ken Griffey Jr. 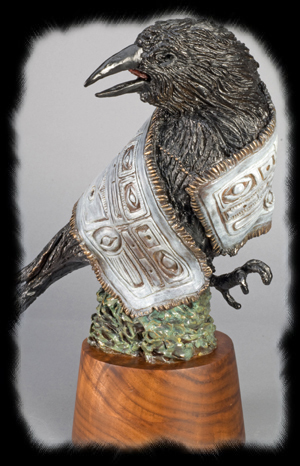 Statue, Bronze Eagle Statue, Bronze Bear , Bear Statue, Eagle Statue,Bronze Otter, Bronze Art Alaska Native, Tlinglt Indian, Raven Clan, Elizabeth Peratrovich, Wildlife Bronze Statue.